The legendary comics creator Dean Motter returns with Mister X: Razed! In the retrofuturistic metropolis of Radiant City, its mysterious creator, Mister X, must protect the city and its residents from themselves, as the architecture of the city itself is a danger to all those within it. 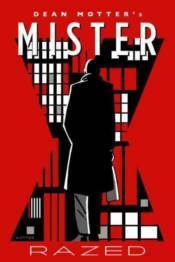 Collects Mister X: Razed #1-#4 and 'Mister X: Frozen Assets' from DHP #33-#35.